Go Beyond’s 4th investor report shows an increase in returns on investment from CHF 15.7m to CHF18.9m in 2017 from 190 investment rounds. 85% of investors who have invested at least once have a breakeven or positive returns. In its 4th annual report, Go Beyond has reported positive results from its activities from the period 2008 to 2017. According to the results, Go Beyond has seen a continuous growth across different domains of the organization. The angel group is now comprised of 677 early-stage investors from 41 nationalities across five continents. With 48% women among them, the angels have made 40’000 investment decisions resulting in 190 rounds investment rounds in 78 companies from 15 countries. Investments of CHF22.2m returned CHF18.9m in cash before fees. The funds were generated from seven companies that exited, either by selling them at a premium or on discount. Additionally, there are 64 active companies with a current Net Asset Value of CHF17.1m. These companies have great potential to create additional cash returns in the future. Go Beyond achieved the reported returns through the use of diversified portfolios and sales of invested companies to industry acquirers. 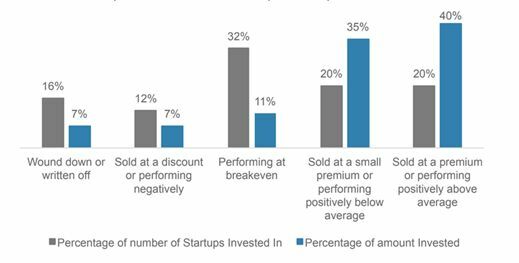 The results suggest that taking a portfolio investment approach, investing in follow-on rounds and having mid-tail exits are delivering success to angels and the entrepreneurs they back. A comparison to prior years shows an increase in numbers by 35% from 2016. 45 deals closed in 2017. However, the average deal value decreased slightly from CHF107’000 to CHF94’000. The number of follow-on rounds increased by 32%. For the first time funding supplied by convertible notes increased contrary to straight equity investments. The image above shows the performance of portfolio companies. Accordingly, 20% of the amount invested is expected to fail, 40% is expected to break even at best, and 40% is expected to provide the positive returns sufficient to recover the unsuccessful amounts and more. The Report also includes the results of a research collaboration between the Chair for Entrepreneurship at the University of St. Gallen and Go Beyond Investing. The study showed that limited industry diversification outside the area of expertise of any specific investor is unlikely to impact portfolio performance positively. This conclusion lends support to using the collective knowledge of the community when pursuing investments for diversification and cautions about embracing one-off investments outside the investors’ knowledge or expertise. To increase the industry diversification outside of the area of individual expertise, investors might leverage shared knowledge within specific investor communities and smaller tickets that allow them to make more investments with the same overall budget. In 2017 Go Beyond launched two programs: the second pan-European Rising Tide Program and NextGen 1. Both programs combine learning by doing, investing and networking. Rising Tide Europe 2, in partnership with EBAN and Next Wave Foundation, is part of a global movement to increase women’s participation in angel investing. NextGen 1 is an angel investing program where young adults and their parents/relatives can learn alongside one another, and build a portfolio of early-stage investments with experienced business angels. The programs encourage participants to join in education programs with webinars, videos, and in-person training while developing a diversified portfolio of 6 - 10 early-stage companies over a 12 to 18 month period. These programs have opened up the opportunity for more women and young adults to become familiar with the angel investing ecosystem and have enhanced their learning experience in building portfolios.